A Consumers Digest Automotive Best Buy. Most Popular Midsize Traditional SUV on Edmunds.com. Autobytel’s #1 SUV. The 2016 Jeep Grand Cherokee already has a bunch of awards in its back pocket, and for very good reason. After all, the SUV offers all of the attributes a driver would expect from these types of vehicles… and a whole lot more. The three impressive engine options provide all of the power and a efficiency a driver could want from an SUV, while the interior offers a unique combination of luxury, roominess, and technology. To put it over the top, the accompanying safety features should keep the Grand Cherokee’s occupants safe and secure. You’re not going to find a similar list of amenities and capabilities for other SUVs. That’s why the 2016 Grand Cherokee stands on a tier of its own. Customers appreciate choices. Therefore, even though it may be easier to settle into a particular nameplate's single engine offering, these buyers should embrace the opportunity to choose between three versatile engine options. The 2016 Grand Cherokee offers buyers a trio of engine options, with each of the units providing their own specific capabilities. One unit focuses in on power, while another preaches excellent efficiency. Meanwhile, one unit combines these two attributes to make for one of the most versatile engine offerings in the class! Even if you're uncertain of which engine to pursue, you'll at least be certain of one thing: you won't be disappointed with your decision. For the best of both worlds, customers may want to consider the impressive 3.6-liter Pentastar V6 engine. For starters, the unit is plenty powerful, able to pump out 295 horsepower and 260 pounds-feet of torque. To put it over the top, drivers can also anticipate a best-in-class V6 highway drive range of 600 total miles. This ends up equaling out to about 26 highway miles per gallon, a number that's often expected from much smaller vehicles. Maximum efficiency and reduced emissions highlight the Grand Cherokee's smallest engine offering, the 3.0-liter EcoDiesel V6 engine. The unit is partnered with an eight-speed automatic transmission, resulting in a best-in-class highway fuel economy (30 miles per gallon). Furthermore, C02 emissions are reduced, so you'll be traveling in both an efficient and clean ride. Fortunately, these attributes don't compromise the power. This V6 is still capable of pumping out 240 horsepower and 420 pounds-feet of torque, which is more than enough power for the highway. For the maximum amount of power, drivers don't need to look any further than the incredible 5.7-liter HEMI V8 engine. Sure, the brand can tout that the unit can deliver a 22 highway mile per gallon efficiency. However, these specs will likely be ignored when you get a load of all the power lingering under the hood. The V8 can crank out 360 horsepower and 390 pounds-feet of torque, by far the best numbers out of all the Grand Cherokee's engines. This results in a best-in-class maximum towing capacity of 7,400 pounds. After a single trip behind the wheel of the 2016 Grand Cherokee, drivers may not want to leave the SUV. After all, the vehicle provides a number of luxury amenities, and the abundance of cargo room makes the nameplate an excellent road-trip or family vehicle. Meanwhile, the technological amenities should keep all of the occupants entertained. Whether they're appreciating the elaborate sound systems or the rear multimedia screens, there's enough technology to keep any passenger distracted. 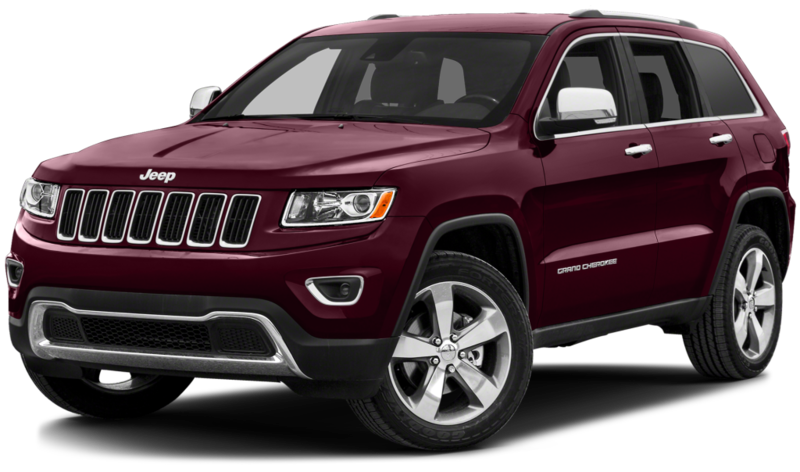 The 2016 Jeep Grand Cherokee is simply regarded as an SUV. However, we wouldn't blame a customer if they mixed this nameplate with a much pricier luxury vehicle. After all, the Grand Cherokee is full of amenities that add an air of opulence to your new ride. For instance, the open-pore wood found throughout the interior gives the ride a refined look, while the premium headliner and detailed stitching will command occupants' attention. Engineers clearly recognized these luxurious features, but they still didn't compromise the other factors that are often associated with SUVs. Drivers can still expect the vehicle to offer up to 68.3-cubic-feet of cargo room, enough space to transport any luggage or equipment. Your younger passengers may not be as impressed by the luxury amenities. Rather, they're looking for some form of entertainment. Fortunately, the Grand Cherokee more than delivers. Passengers can enjoy all of their favorite tunes via the Grand Cherokee's touchscreen infotainment system, which allows drivers to access SiriusXM Satellite Radio or their preferred playlists (via their iPhone). To truly appreciate these tunes, drivers can opt for the three incredible sound systems, including the state-of-the-art Harman Kardon sound system (featuring Logic 7 multichannel surround-sound processing and 19 GreenEdge loudspeakers). For even more entertainment, rear passengers can utilize the dual-screen Blu-Ray and DVD Entertainment System. The nine-inch screens allow occupants to enjoy movies, music, or even their favorite video games. Plus, thanks to the inclusion of the wireless headphones, drivers won't be bothered by whatever media the rear passengers are enjoying. If you've just dished out money on a new SUV, you presumably want that vehicle to maintain it's "new" look. Plus, if you're traveling with younger passengers, you'll want to be assured that they're safe and secure. Luckily, the Grand Cherokee provides drivers with an assortment of safety features. The preventative capabilities should keep the vehicle out of harm's way, while the protective features should keep all of the occupants safe and secure. Drivers will clearly do everything in their power to avoid a collision. However, in the event of an accident, the Grand Cherokee should provide enough protections to keep all occupants safe and secure. The "advanced, multistage driver and front-passenger airbags" will provide enough cushion for each of the vehicle's occupants. Meanwhile, the exterior crush zones and side guard door beams will help absorb the dangerous energy caused from the crash. In this case, the passengers should be immune to this "energy," thus preventing any bodily harm. If a driver does find themselves in an emergency, a simple click of the 9-1-1 Call button will send immediate help. Drivers can also press the 'ASSIST' button, which will dispatch emergency services or roadside assistance. Fortunately, a driver shouldn't find themselves in an accident thanks to the Grand Cherokee's assortment of preventative safety features. Amenities like the Blind Spot Monitoring (which alerts the driver when it's unsafe to switch lanes) should keep your SUV looking good as new. Features like Forward Collision Warning are one of the technological highlights of the SUV. The system will alert the driver when they're approaching another vehicle too rapidly, and the vehicle can even apply the brakes if necessary. Meanwhile, the ParkView Rear Back-Up Camera will allow drivers to monitor everything that's happening behind their vehicle, thus avoiding any pesky fender benders. The 2016 Grand Cherokee is the logical choice, but where should you be purchasing that SUV? If you live in the Colorado Springs, Colorado area, there isn’t a better choice than The Faricy Boys. The dealership offers fair and transparent prices on all of their new and used vehicles, and drivers won’t be limited to only Jeeps. Furthermore, the service department will help repair any issues you run into, while the finance department will offer assistance with your budget. While the 2016 Grand Cherokee offers everything a driver could possibly want, The Faricy Boys offers everything a buyer could possibly want. It’s basically a match made in heaven.